book reviews – Page 2 – Escape Reality, Read Fiction! 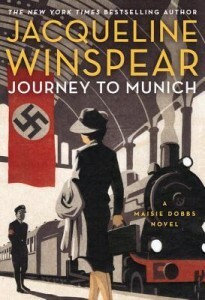 It’s March, which means it’s time for this year’s Maisie Dobbs adventure. I’m just sorry her publisher isn’t sponsoring the “Month of Maisie” any longer, as that always made for a terrific excuse to pick up one of the earlier books in the series as well as the new one. For Maisie, the year in 1940, and London is in the middle of the Blitz. 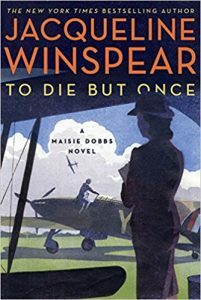 And so is Maisie, as she and her best friend Patricia are doing in London what they did in the Great War so many (and so few) years ago. They’re driving an ambulance and taking the wounded from the “front” to hospital. It’s just that this time, that “front” is the streets of London. Their roads are better paved this time around, but the shelling is even more deadly. Just because Maisie is driving an ambulance every night, that doesn’t mean that she isn’t solving cases during the day. Even though she’s “dead on her feet” half the time, victims of murder still need justice. Her worlds collide. One night, Maisie and Patricia have an observer on their ambulance run – a female American journalist. Cath Saxon is reporting the war from a woman’s perspective – with the hope of becoming one of the “boys” working for and with Edward R. Murrow. Just as Cath gets in – she’s out. She’s found murdered in her rented rooms, and both Scotland Yard and the American Embassy call on Maisie to find out who killed her. It might just be a love affair gone wrong. It might have something to do with her reporting. There’s also a chance that her powerful family back in America decided that Cath’s sympathetic reports of the plucky and heroic English response to Hitler’s Blitz might be too embarrassing for their Hitler-sympathizing friends back home. Maisie is supposed to be working with an American agent on this case. Mark Scott is the same American agent who saved her life during her nearly disastrous Journey to Munich. But as the case progresses it’s clear to Maisie that the man who is supposed to be working WITH her is working on an agenda of his own – and mostly far from Maisie’s inquiries. And that at least part of his hidden agenda has more to do with Maisie herself than any case either of them might be investigating. Escape Rating A: This is a series that I absolutely love, and eagerly await the next book. So I’m already on tenterhooks for book 16, hopefully next March. But in the meantime there’s plenty to discuss regarding The American Agent. 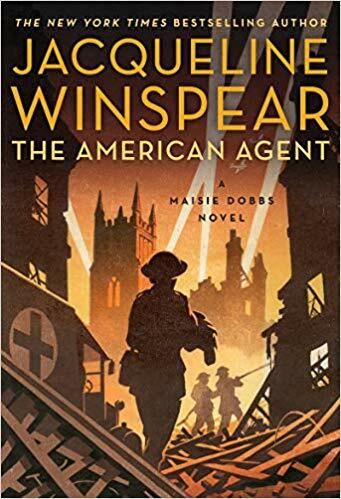 One thing that struck me as I read about Maisie and Patricia’s exploits as ambulance drivers was the way that it brought home just how close World War II was to World War I. Both women served in the Great War, Maisie as a nurse and Patricia as an ambulance driver. As this book opens, they are still only in their early 40s, still in their prime. And serving again. Although there are many young people who think that war is glorious, as evidenced by the behavior of Patricia’s son in To Die but Once. At the same time there are plenty of people populating Maisie’s world who served in the first war, are serving in the second, and know from grim experience that war is terrible. And are equally aware that they must fight, that surrender is unthinkable. Ironically, we are re-watching Poirot, and the later episodes of that series also deal with the impending war. The Clocks had been rewritten to take place before the war, and part of the plot revolved around government agents who were giving secrets to the Nazis to make Britain fall faster so that the war would end sooner. The Duke of Windsor was part of this movement, much to the embarrassment of the Royal Family. Charles Lindbergh, the aviator, was a prominent member of the America First Committee, which wanted America to stay out of the war and tacitly agreed with the Antisemitic tone of the party. One of the other prominent members of the America First movement was Joseph P. Kennedy, the father of President John F. Kennedy and Senator Robert Kennedy. Joe Kennedy was also the U.S. 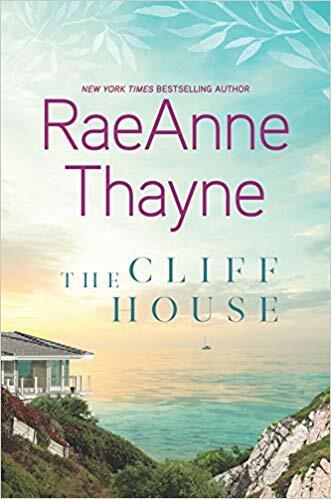 Ambassador to Britain during this story, and Maisie’s American Agent is using the hunt for Cath Saxon’s killer to poke into Joe Kennedy’s dubious dealings. Because there were plenty to poke into. It works as a ruse because Cath’s father, a prominent U.S. Senator, is also an America Firster. And he, along with his “friends” were dead set against Cath reporting material that was sympathetic to the British cause. The family was dead set against Cath being a reporter at all. Maisie has to look into just how dead they were set. And wonders if her investigations will lead her into places that the U.S. Embassy will not want her to go. Or, at least to report. But Maisie never presumes, never presupposed and never lets herself get dead set on any hypothesis. She follows the clues where they lead her. No matter how much she has to dig, and how many secrets she uncovers along the way. It’s what makes following her so interesting, and her character so fascinating. I’m looking forward to reading more of Maisie’s war in the next book. 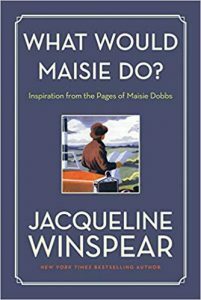 And while I wait, I think I’m going to treat myself with a dive into What Would Maisie Do? This was a lovely wrap up to the series. Or, to put it another way that feels much more accurate, Lonen’s Reign provides the concluding chapters to this lovely fantasy romance. That’s a hint, by the way. The Sorcerous Moons series reads way more like a single book split into chunks than it does a series of individual books. It only works if you read from the beginning. 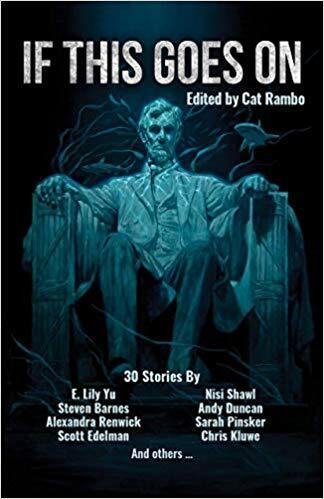 Every time I get a new “chapter” I find myself reading the synopses and my reviews of the previous books to catch myself up – even if it hasn’t been all that long since the previous book. All the action in this book rests on what came before. Which is fitting for the concluding “chapter” of an epic (in scope if not in length) saga. This is also the point where the story comes full circle. We began, in Lonen’s War, with then-Prince Lonen and his Destrye attacking the stronghold of their enemies, the Bara. Where Lonen discovers a disregarded Princess Oria imprisoned in her tower by her own weaknesses. 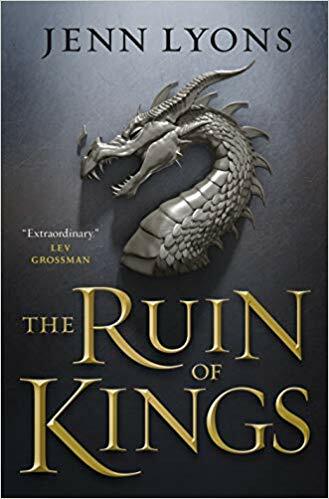 Oria finds herself the only functioning member of the Baran royal house, and brokers a peace treaty between her people and the Destrye – only to have that well-thought out and surprisingly well-working peace broken the moment her brother wakes up and forcibly takes the crown. From that point forward, the story moves back and forth between Destrye and Bara, as Oria discovers the depths to which her own people have sunk – and the desperation that has forced Lonen’s people to rise and strike back. Along the way, Oria discovers that all of the prohibitions, weaknesses and fears that have held her back are a tissue of lies and misdirections. And Oria and Lonen make a marriage of state and convenience that turns into so much more. This is the point where the finally undisputed King of the Destrye, and his newly anointed Queen Oria risk everything they have on one final gamble against the heavily fortified and magically defended Bara – in the hopes of saving both their peoples. All of their people. On both sides. Escape Rating B+: I’m kind of reviewing the whole series at this concluding point. 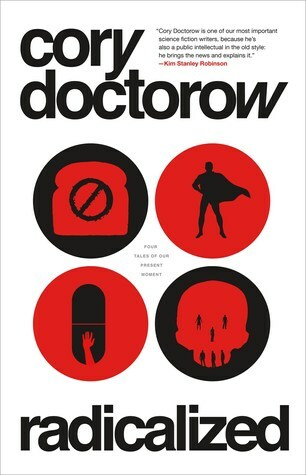 Because this book really doesn’t make much sense on its own, it feels necessary to look at the series as a whole. 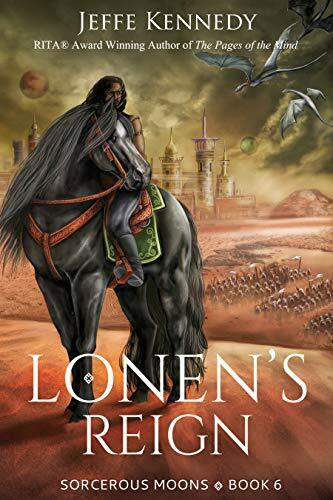 At the same time, I have to say that Lonen’s Reign feels like a fitting conclusion to the saga begun in Lonen’s War – and it feels equally fitting that both the first and the last book are titled after him. 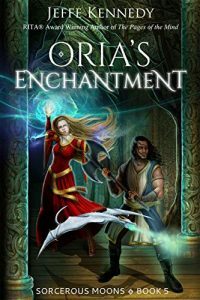 He began the action at the outset, followed by Oria’s reaction in Oria’s Gambit, followed by two middle books, then Oria’s finally coming into her own power in Oria’s Enchantment and now we sit at the conclusion. The two sides began at war, not that the Barans would have considered their actions warlike. Bara used to be a lush paradise, but the climate changed and their city turned into a desert. Instead of adapting, they used magic as well as engineering to steal water from the lands that surrounded them, making even more desert. Eventually they reached the lands of the distant Destrye, absolutely certain that their magical might gave them the right to strip those lands of their water and kill anyone who fought back. Lonen brought the war home to them. And left with the prize and pride of Bara, Princess Oria. 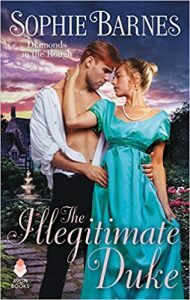 As they fell in love, it gave her strength of will, and the desperate determination to reach beyond everything that she had been taught. She had to in order to survive – and to be able to do the right thing. Oria grounded Lonen, giving him the wisdom to become the king his people needed, in spite of the betrayals he suffered at home. Their union, which does indeed become the love story for the ages as I said in my review of Lonen’s War, provides a path forward for both of their peoples, who have now become one. In some ways, the story in Lonen’s Reign feels as if it is missing a few bits – almost all of the backstory is in their earlier books. Because I really enjoy worldbuilding, it also felt as if Oria’s final revelations – the climate change, the resulting subjugation and despoiling of a wider and wider swath of territory, and, most of all, the way that magic as practiced in Bara became ossified in a way that almost literally set their people, and particularly the women, into stone that preserved the predatory status quo – got a bit of a short shrift. I’d love to know more about how it happened. Maybe that’s another book sometime in the future. 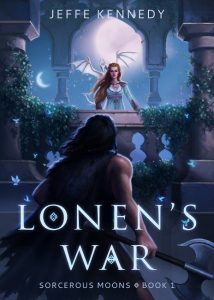 Lonen’s Reign turned out to be a quick and mostly satisfying wrap-up to a fascinating fantasy romance series. I’m looking forward to both the author’s eventual return to the awesome Twelve Kingdoms series – because that is edging towards its final confrontation – and to her new fantasy romance series, beginning with The Orchid Throne later this year. This is going to be a mixed feelings review, because my feelings about Griff are very mixed. Or rather, my feelings about the Hell Squad series in general and Griff’s relationship with Indy in particular are more than a bit mixed. 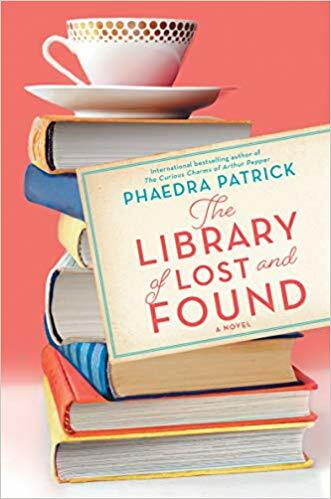 And I’m feeling conflicted because my feelings about this author’s work usually fall much higher on the “like to love” range, and this one just didn’t work for me. So there’s a bit of sad there as well. Griff is the OMG 17th book in the Hell Squad series. The setup is post-apocalyptic, with the apocalypse being very specific and extremely recent. A race of alien-dinosaur-raptor hybrids have invaded a very near future Earth and wrecked the joint. The Gizzida initially came to strip the planet and take all its resources, including the humans. There’s more than a bit of Borg in the Gizzida as they don’t merely wipe out the populations of the planets they invade, they use genetic engineering to convert both the human and animal populations into more of themselves. The series follows one group of human survivors. This particular bunch were in Australia when the Gizzida took over (most but not all are Aussies), holed up in a remote military installation and have been sticking it to the Gizzida as much and as often as they can in some rather effective guerrilla warfare. As the series has progressed, key members of the population of “The Enclave” have managed to grab their bit of happiness in spite of the destruction all around them. Life really does go on. This particular story features Griff Callan, a member of one of the squads that brings that guerrilla warfare to the Gizzida, and Indy Bennett, the communications officer for his squad. Griff and Indy knew each other before the disaster. Her brother was his best friend until their relationship went seriously pear-shaped long before the aliens invaded. They’ve always loved each other, but have never been in a place where they could admit it. They grew up together, but Indy was just younger enough to have made any possibility of romance seriously skeevy. And once she was old enough, well, there was that whole “bro code” that makes your best friend’s little sister untouchable – no matter how much she wants to be touched. Which doesn’t mean that Griff didn’t break her heart with his refusal. And he’s scared he’ll break it again before they have any chance at all. But it’s a chance he’s finally willing to take. If the aliens don’t take them both out first. Escape Rating C+: Whenever I see a character named Indiana I hear Sean Connery’s voice from Indiana Jones and the Last Crusade complaining to his son Indy, “We named the dog Indiana.” Clearly at least one of Indy Bennett’s parents was a fan. 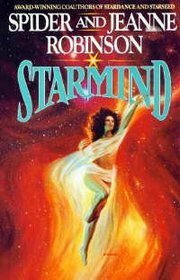 Speaking of fans, while I am definitely a fan of this author’s work, I was not a fan of this particular story. I love the premise of this series, so if you like post-apocalyptic where the heroes get to stick it to the ones who brought that apocalypse, the series is generally a blast. The first book is wrapped around the romance between the leader of the Hell Squad (Marcus) and HIS communications officer. And thereby sits a chunk of why I have such mixed feelings about this particular entry. It’s not that there ARE patterns in the stories, because all stories of all types follow patterns. It’s that the specific patterns used in this series repeat themselves, and over 17 books those repeats are becoming a bit too obvious for this reader. I fully recognize that those very same patterns are what make many people love this series – no matter how long it goes. The story here, and frequently throughout the series, is that the couple in question finally acknowledge both that life in the Enclave with the Gizzida sniping at them is WAY too short, and that they have feelings for the other person that they have refused to acknowledge because one party, usually the male, thinks he’s not good enough for the female. Although that’s been reversed a couple of times and I’ve liked those better. After the couple finally acknowledges their feelings, they face a situation where the female has to go into battle with the squad, and she is either captured or nearly so. The male has to ride to the rescue, incurring life threatening injuries. They forgive whatever caused any tension between them during his recovery and then live happily for now. This series really can’t include a happily ever after, not because of the internal dynamics of the couples in each story, but because the Gizzida make any “ever after” extremely tenuous at the moment. In the case of this particular story, the scenes where Griff finally declares his intentions involve him carrying her out of meetings in a fireman’s carry, with her protesting all the way. It felt like his need to mark his territory was more important than her need to be professional and part of the team that is, after all, trying to save the world. I felt it took away from her agency. YMMV. My other issue with the series as a whole is that it’s just taking too long for the Enclave and their allies around the world to kick the Gizzida off our Earth. Ironically, it hasn’t been all THAT long within the scope of this world, but 17 is a lot of books. There’s been some progress towards their overall goal, but I’ve become impatient waiting for it to finally happen. And that’s affecting my enjoyment of the individual series entries at this point. That being said, I still love Anna Hackett’s writing, and I’m eagerly anticipating her next book, Heart of Eon. 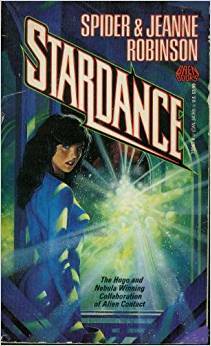 I found her first in her space opera SFR, and it’s still where I love her best. Not that the Galactic Gladiators haven’t also carved out a piece of my heart – but I’ll have to wait longer to get back to Kor Magna.